Oh, get your minds out of the gutter. I'm a "lady", (here anyways). Just kidding, I always exercise decorum, so much so that my husband says I need to "let up" (but that's another post). Back to business though. I've had the proverbial "Aha moment" as Oprah likes to call it, but long before her, people called it the "light bulb moment". At any rate, I had one, and I think its just genius. Well it's pretty dang cool. Remember when I was begging for people to come over and read my blog, "oh woe is me, I have not readers", and I mentioned how people have sponsors and they do contests and give away cool prizes. Well woo hoo for them, but look at me, ooh ooh, I have stuff too. DUH. I make jewelry, or at least I like to try to make jewelry, but I value sleep too much, and the children and husband need so much, and did I mention sleep. So I don't get to make as much as I would like, but I do so enjoy it. I do get commission work, which pays nicely, but I have something on my heart that I would just love to share. My Prayer Beads. The concept formed when I wanted to do something nice, for someone whom had done a kindness for my mother. After hearing that she performed such acts of kindness to ease the pain of dealing with her own grief, I wanted to share my faith with this woman, and encourage her. I knew that she prayed, but I did not know what her faith was. I researched Rosaries and their history and religious significance, but decided against making her one, especially not knowing if she were Catholic or not. I came up with my own design, based on my own study of the Bible and some creative license. The Prayer Beads are all built the same, with one exception. There are 12 smaller beads to represent the 12 tribes of Israel, and the 12 Disciples, and three larger beads to represent the Trinity. The one exception is that a person may choose to put a cross or a crucifix as the anchor. The crucifix of course as a reminder of the great price that was paid for us, and the cross as an equally impressive reminder of our faith. Prayer Beads are an excellent way to share your faith with others. They make thoughtful gifts for the bereaved, or newly engaged or married couples. 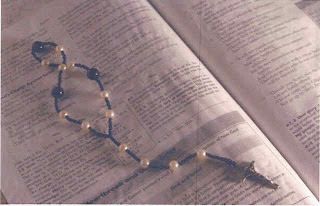 I always explain my faith to people as I give the beads and that I will be praying for them, continually. Prayer Beads are an excellent way to share your faith with others. They offer the beautiful sentiment of prayer to be shared. For children and adults alike Prayer Beads make a wonderful Easter gift. They serve as a reminder of the true gift that was given to all by the sacrifice that Christ made. This is what I've got. What I want is more readers. So here's how it will go. I'll run the contest for a week. All you have to do (hehehe) is leave a comment on this post. To get another entry go over to my website and look around and leave another comment here telling me one (or more) thing(s) that you liked there. To get another entry, go through my archives and tell let me know what you think about this here blog (be prepared, it's a real hodge podge of emotions). An additional entry can be gained (we'll count this one as two) if you become one of my 'Faithful Readers' b.k.a. "Followers". The winner will be randomly drawn from all the comments that are received, and followers. I saw you on SITS this morning - you were the blog in front of me on the roll call. I love the prayer beads! I'm adding myself as a follower and I'll take a look at your design blog as well this morning. Come over and visit me at Another Day Today if you get a chance. I love the Seabreeze necklace. And the turquoise bead necklace. And pretty much everything you've designed. Best of luck with the giveaway, and gaining more readers. It is a hard thing to get, and maintain. I love your prayer beads. They are such a beautiful and creative way to share your faith. They would also make great mother's day gifts too. Good luck with your give-a-way. I love your prayer beads, too. And would consider them a lovely adjunct to a rosary, which I also use. I love symbolism in my prayer, so your beautiful beads really appeal to me. Thanks, and I will read your blog.